Am I the only one who watched this Christmas Eve? Am I the only one who ever watched this?!? Parts of it were stupid, but parts were hysterical! It's worth a rental for the opening scene alone (with James Caan, Fran Drescher, Rebecca Gayheart and Chris Kattan being menaced by Santa Bill Goldberg). And, for a movie made this past year, I can't believe how young Emilie de Ravin (from "Lost" looks). I saw this at Best Buy the other day, and the first thing I thought of was, "Isn't this the fictional movie that was being made in Ernest Saves Christmas?" I saw it on TV back in November. It was surprisingly a good funny movie. I agree, that opener alone is worth the rental! I will buy this as soon as I can. Grrr....went to Tower Records today and they didn't have it and then went to Blockbuster and they didn't have it to rent. Oh well, I'll get it sometime next week. saw it on SpikeTV ...was pretty funny...although they blocked out the curse words..incase anybody is wondering if this is a good movie to show the kids, definately not, it's got cursing, and is rated R..
BrentLumkin, extras are (according to dvdempire)..
Commentary with writer/director David Steiman and producer Matthew Leonetti, Jr. It's actually a pretty well done, packed DVD. I'm planning on buying it before next year. Mucho replay value. After using a quarter tank of gas driving around from store to store today, I finally found a copy of this at Best Buy and is well worth it. I'll have to watch this every Christmas (along with year round) with Santa Claus (1960's Mexican movie where Santa lives in outer space, weird movie) and the He-Man/She-Ra Christmas Special. I'll be looking for this tomorrow at my local BB. I still don't think I could pony up for this movie even though Goldberg is from my hometown and is a very nice guy. It's funny. Like everyoine else says, has a few scenes that are laugh out loud hilarious. Very funny opening scene. Loved it. 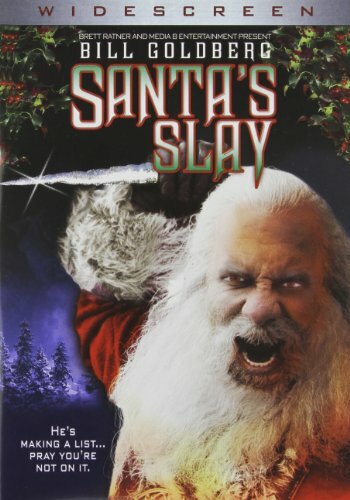 I'm a wrestling fan and didn't expect much a Killer Santa movie starring Goldberg? It was great. Better movie and dvd than it had any right to be. And I marked as a Wrestling Fan when The Spear was used(One of Goldberg's Finishing Moves). Watch out for it fellow wrestling fans. and yes the opening scene is pure gold. And here I thought this would be a total throwaway. Maybe I'll get it if it's less than $10 somewhere.